Want a play space that's cooler than the rest? Add some shade! Not only do shade structures add a unique look to your playground, they also keep it cool and comfortable for park guests. Children and their families can play longer without overheating. Heat from the sun can be a burden after a while, and children will want to go back indoors for relief. By shading your playground, children will be able to play longer, allowing them to have more fun while staying active. Shade structures typically keep spaces 25 degrees cooler for children to play in. Keep equipment cool to the touch. Many playground injuries come from children touching over-heated playground structure surfaces that are exposed to the sun for too long. Shading your play area will help prevent children from getting burns. Protects children and their families from harmful UV rays. Getting just one blistering sunburn can increase a person’s risk of getting skin cancer later in life. By adding UV-protective shade to your playground, children and families can have fun and stay active outside while protected from harmful UV rays. Increases the life of your play equipment. In addition to cooling the playground, shade structures will actually increase the life of the play equipment. It does this by protecting it against fading and cracking that happens from sun exposure over time. Here are five ideas for adding shade to your playground. 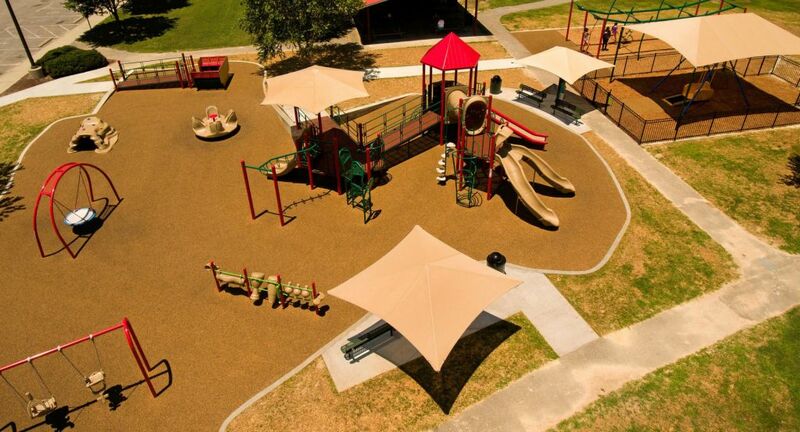 Cover the entire play structure with our GameTime Shade Sails or Hip Ends in square, rectangle or hexagon shapes. Integrate a shade canopy into the posts of your playground. Adjacent freestanding shaded areas over picnic tables allows families to bring a sack lunch and enjoy a day at the park. Bench canopies give you an economical option to add shade to your playground when you have a limited budget. GameTime's shade products block up to 97% of harmful UV rays with various fabrics, come in many different sizes and colors, and use Anti-Ravel™ Technology that prevents fraying and seam distress. Our shade products not only offer quality and durability, they also are backed by a global network of certified sales, service and installation professionals who can help you select, install and maintain your shade products. Now that’s pretty …COOL!